We are Josh & Teri Cardwell from a small town in Alabama. 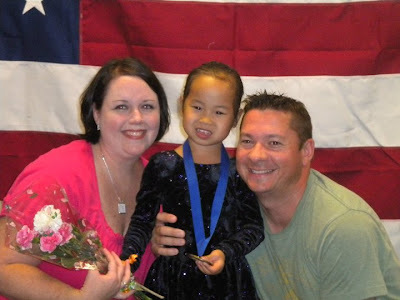 We have been married for almost 18 years (high school sweethearts) and adopted our first, and only child, from China in 2007. Maddie was 8-1/2 months old at the time. She is now a spunky little 4-year old who brightens our lives on a daily basis. We were pretty content with our little family of three and thought Maddie would be our only child – biological children aren’t possible and the cost of another adoption seemed too out of reach. While visiting some friends last May, one of them asked if we had plans to adopt again. I said “no” that we were quite content. Then a week after that conversation, everything changed. God certainly has a sense of humor that way! One of my friends in the adoption community emailed me asking for prayer because she had found another girl from China who she really wanted to pursuit her adoption. It peaked my curiosity because she said “found”. 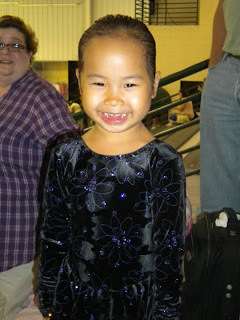 The only experience we had with adoption was a healthy referral so Maddie was matched with us…we didn’t “find her”. So I asked my friend how she found this girl. After emailing back and forth several times, my curiosity got the best of me and I did a brief “search” one day at lunch. That was the beginning of our journey to Piper…..
During lunch that day, my life changed. I “happened” to run across her profile and picture. What astounded me was that she was older…and when I say older, I mean 12 years old!! If someone would have told me just the week before that we would 1) adopt again, and 2) it would be an older child…better yet…almost a teenager…I would have laughed in their face!! But, here I was…sitting at my desk…looking at the face of a young girl who I KNEW was my daughter! At the bottom of her picture, the caption read: “If you have room in your heart and home for this child, please email us for further information”. At that moment I knew I did!!! So, I printed off her limited information and picture and thought I would take it home and possibly show it to hubby at dinner, if I had the nerve. 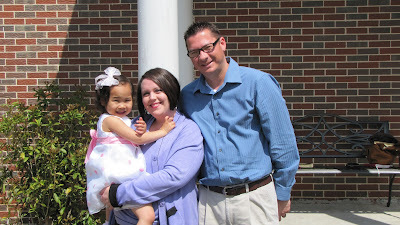 Fast forward a little bit…once we received her info and prayed over it, we knew we were to pursuit her adoption. We also found out that in China, waiting children are “aged out” of the system at 14 years old….so if she was not adopted by the time she turned 14, she would go on the streets. WE KNEW WE COULD NOT LET THAT HAPPEN!!! We had NO idea how we would pay for this adoption as we didn’t even have the extra money for the application fee, much less $30,000! But, we KNEW God had called us to this! We found out that the day the agency posted her picture was the day we found her! And after they placed her on “hold” for us, multiple families asked to pursuit her. Amazing! And throughout this entire process, God has been very AWESOME…He has brought three people across our paths who speak fluent Chinese and have offered to help with her transition and one person who is native Chinese and gave us her travel agent who specializes in trips to China at very low costs! The instant we made the decision to step out on faith and do this, God began meeting our needs in a miraculous way! So many people have graciously donated, we have held multiple fundraisers and have depleted our own personal finances to get this far in the adoption. Unfortunately, we have been denied assistance with the grant organizations and no-interest loan organization that we qualified and applied for. All of these organizations have given us the reason of “too many applications and not enough money to go around”. And while our friends and families have been SO generous, we are lacking quite a bit of money! After many prayers asking God for direction, we felt led to ask Lorraine if she would be willing to help us get the word out! Now it’s time to send a “Plea for Piper” to anyone who will listen! We are two months away from traveling to bring her home! The bare minimum needed by April is $15,000! And we also have the task of purchasing an entire wardrobe for her as she will come only with the clothes on her back – that in and of itself is quite expensive! We are humbly asking for help! Any amount is appreciated and nothing is too big or too small to make a difference!! It is extremely hard to humble ourselves to ask for help. Believe me we would not be asking if we had not already exhausted all other avenues. But, we will ask for help if it gets her home!! She turned 13 years old last month so time is of the essence! We must get her home this year! Please email us at jmctdc@yahoo.com and we will send our information. AAC Adoption & Family Network, Inc.
We also want to mention that our goal and wish is that if we are blessed above what is needed for this last phase, we want to “Pay it Forward” to another family who is facing the same situation that we are currently facing. Finally, we wanted to encourage others who are thinking about adoption or have never considered adopting an older child. We were in your shoes just a little less than a year ago! I encourage you to read older posts on Lorraine’s site. It was through reading her posts about adopting Meribeth, and then Naomi, that we were inspired to pursuit this adoption and we were educated about the challenges we face but also how to overcome the obstacles of adopting an older child. It encouraged us that it can be done (and done successfully)…even in the midst of everyone we know telling us we were “crazy”. Thank you, Lorraine, for your honesty, faithfulness, inspiration, encouragement (even when you may not know you are doing so), for advocating adoption, for helping other families in need, and most importantly for allowing yourself to be used by God in such a mighty way! We are humbled that you were willing to get our story out to the masses in hopes that someone is moved to help in our “Plea for Piper”. You are truly a blessing and we pray for you daily! God bless in everything you do!! *Edit 2/23 at 1:30PM by Lorraine: A reader educated me (Lorraine) that "China Doll" does not have a positive connotation to Asian women, which I was completely unaware of in my cultural ignorance, so I removed that term from my introductory paragraph. I apologize if I inadvertantly offended anyone by using that term, it was not my intention in any way to be offensive.